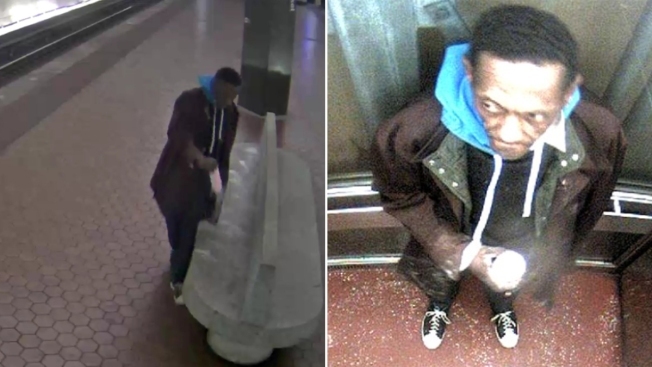 Metro shared these images of the person they say spread an unidentified white powder substance on benches at Eastern Market and then in an elevator at Metro Center. If you see him or have information, call Metro Transit Police at 202-962-2121 or text MyMTPD (696873). A stretch of Metrorail service was suspended in D.C. on Monday after a man was seen on surveillance camera sprinkling a powdery white substance. The man first sprinkled the substance on benches in the Eastern Market station about 8:45 a.m. Monday and then sat in it, Metro officials said. Then, he exited the system at Metro Center and sprinkled the substance in an elevator. Metro Transit police tested the substance and found that it was not hazardous. Information was not released immediately on what it was. Surveillance images show a man wearing a large black coat, blue hood and black-and-white sneakers appearing to dump a powder onto a Metro station bench. Thomas S. Greene, 59, was arrested by Metro Transit police. Prosecutors will determine whether he will face charges. Blue, Orange and Silver line service was suspended between Federal Center SW and Stadium-Armory. The Capitol South, Eastern Market and Potomac Avenue stations were closed. Metro Center's 12th & G Street entrance was closed and later reopened. Service was restored by noon, but delays remained. A Metro spokesman said that Metro use was lighter than usual Monday morning because of New Year's Eve and the government shutdown. Anyone with information on the suspect was asked to call Metro Transit police at 202-962-2121, or text MyMTPD.